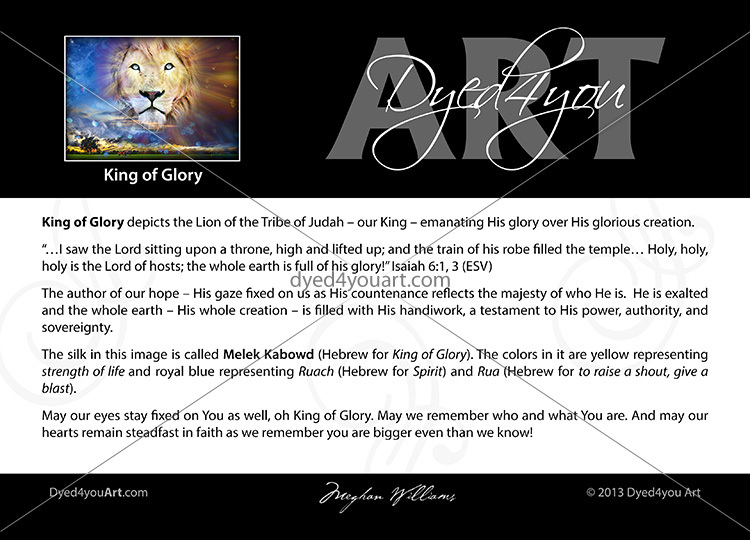 King of Glory depicts the Lion of the Tribe of Judah – our King – emanating His glory over His glorious creation. Isaiah 6:1, 3 (ESV) …I saw the Lord sitting upon a throne, high and lifted up; and the train of his robe filled the temple… Holy, holy, holy is the Lord of hosts; the whole earth is full of his glory! 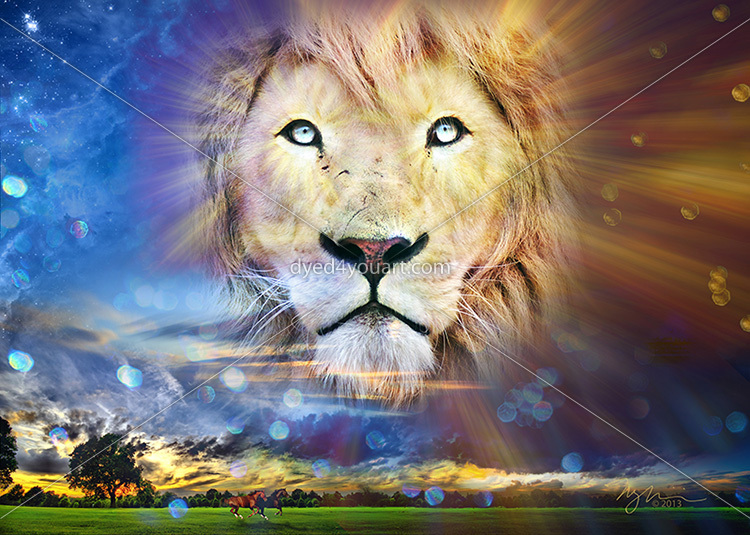 Psalm 24:8 (VOICE) Who is the glorious King? The Eternal who is powerful and mightily equipped for battle. The author of our hope – His gaze fixed on us as His countenance reflects the majesty of who He is. He is exalted and the whole earth – His whole creation – is filled with His handiwork, a testament to His power, authority, and sovereignty. Psalm 44:5 (TPT) Through your glorious name and your awesome power we can push through to any victory and defeat every enemy. Beloved, no force is too strong for the King of Kings, the Lord of Heavenly Armies, God Almighty, the Great I AM. I AM your strength and your deliverer, the lifter of your head. Stand and praise, for My promises surround you like a shield, wholly reliable and forever true. I AM awesome in holiness and My glory and power fill the earth. Stand in awe of Me. For I AM mighty in power, before Me demons will tremble and darkness must flee, and you know My name. Psalm 16:11 (NKJV) You will show me the path of life; In Your presence [is] fullness of joy; At Your right hand [are] pleasures forevermore. Beloved, in My presence is fullness of joy. The world would have you believe serving Me is drudgery. Your flesh seeks to convince you that worldly entertainments are more exciting. But beloved, those are simply quick counterfeits of downloads from heaven. As with any relationship, ours is built over time. It requires commitment and dedication, but it is well worth the cost for true contentment is found there. Not the fruitless byproduct of the world’s offerings that often leave you more empty than when you began, but deep abiding satisfaction and wholeness that is found only in intimacy with Me. No, I cannot be manipulated or controlled like a television is turned on and off with channels switched at will, but that which you will find in Me, is the only thing that truly satisfies. Come and know Me. Come discover Me. Put in the time and effort recognizing it for the blessing it is – Melek Kabowd (the King of Glory) who desires your time and attention; Abba, your loving Father who desires the best for you; YHVH Bore (the Creator), the One who knows you intimately because He made you and understands every facet of your heart; Palet (your deliverer), the One who sets you free. Beloved, you know I love you and you’ve been told I call you friend, but never allow our intimacy to cause you to lose sight of who I AM. I AM the LORD, strong and mighty in battle. I AM the King of Glory and Lord of All. I AM the Lord of Hosts – the Commander of Heavenly Armies – the vast hosts of Heaven stand at My ready. I AM sovereign. In our intimacy, do not make Me small in your eyes – a comfortable little god you can keep in your pocket and pull out on a bad day. I AM far bigger and far greater, and I AM not one to be manipulated or controlled. I fiercely protect those I love, and I will not be mocked. See Me as I AM. Worship Me and know Me. Intentionally keep your heart in a position of reverential awe. I AM worthy. Psalm 24:7 (TPT) So wake up, you living gateways! Lift up your heads, you ageless doors of destiny! 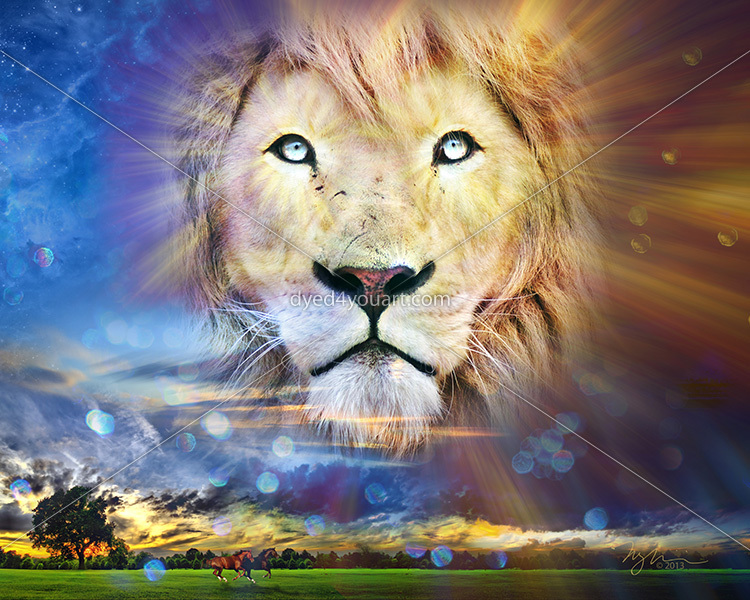 Welcome the King of Glory, for he is about to come through you. Beloved, make way and make room. Swing wide the gates of your heart and make room for Me to come in all My Splendor. Live a life that models the beauty of one who is open and yielded to Me, for the spiritual power of that will shift atmospheres and cause the hardest hearts to pause in wonder. Be a living testimony to the love of God – My love, for as you consciously and continually yield in your heart it causes a spiritual shift that becomes evident in the natural. So wake up and open the gates and prepare for things to move! The silk in this image is called Melek Kabowd (Hebrew for King of Glory). 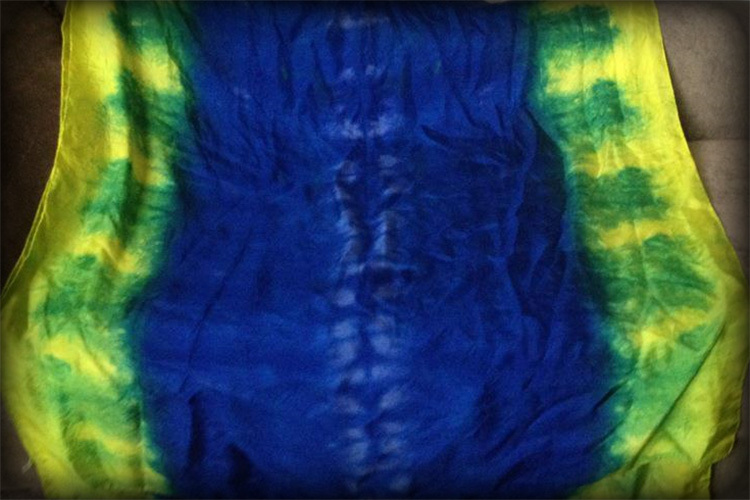 The colors in it are yellow representing strength of life and royal blue representing Ruach (Hebrew for Spirit) and Rua (Hebrew for to raise a shout, give a blast). May our eyes stay fixed on You as well, oh King of Glory. May we remember who and what You are. And may our hearts remain steadfast in faith as we remember you are bigger even than we know! Yes totally appropriate that it was released during the Days if Awe! !